Which is better? A bank or a broker? Should You Choose a Bank or a Mortgage Broker? A mortgage broker works for you and not a bank. A mortgage broker works towards getting you the best home loan for your individual needs. They’ll do all the work for you, approaching the banks and other lending institutions on your behalf, hunting for the best deal possible. A mortgage broker specialises in their area. They know about which lenders offer which packages and how to get a mortgage if you have a low deposit or poor credit rating. You also don’t need to pay a broker for obtaining a loan for you, that comes from the bank! So, you end up saving time and money just by working with a mortgage broker. It would be considered the traditional way of securing a mortgage, however things are changing. Approaching a bank directly is not the best way of getting a home loan nowadays. In fact, it is often more than one bank you’ll need to meet with and who has time to talk to all the banks? We’re mortgage brokers. We work for you, not for a bank. Our team of brokers have access to hundreds of products and dozens of lenders. This allows us to find the best possible fit for you. A mortgage is not only a sharp interest rate – the structure of the loan, allowing extra repayments with no penalty, or having a loan structure that best protects you from increases in interest rates are the way to go. Contact us today and let us make things easy for you by arranging your next home loan. We all need it, and we can all benefit from having expert advice. Like mortgage brokers, insurance brokers are here to help you, and like mortgage brokers they have access to hundreds of products and dozens of insurance companies. How much do we need? What are the best products for our situation? Are we paying too much for our existing cover... it can be very complicated! With more than 25 years in the Finance industry, including at Senior levels both Overseas and in New Zealand, Jason is very skilled at understanding what is important to the clients he meets, and is able to save you both time & costs. For several years Jason was also responsible for training new financial advisers across New Zealand, and is able to give you advice on all aspects of Insurance. As of today (1st April) changes to the KiwiSaver first home buyer packages come into effect. 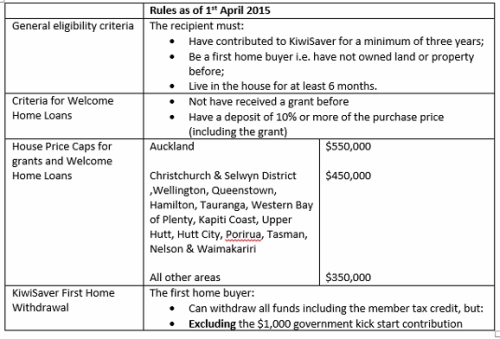 The KiwiSaver First Home Deposit Subsidy has been replaced with a KiwiSaver Home Start Grant. Put simply eligible first time homebuyers will now be able to withdraw all of their KiwiSaver savings except the $1,000 kick-start from the government. There will also be greater alignment with the KiwiSaver Home Start Grant and Welcome Home Loans for house price caps. The table attached shows the changes. For more detailed information please click here to go through to the Advanced Mortgage Solution Website. If you want to talk to us about how we can help first time home buyers, give us a call on 0508 466 356. People – there is a war out there! A war on lending. You may have seen the headlines SBS bank have a ridiculously low fee of 4.99% fixed for five-years. The advertising was a bit ambiguous, stating that you had to be an existing customer of SBS however, this is not the case. At Advanced Mortgage Brokers we can access this deal for you but we have been told by SBS that this rate will be available for a very limited time. If you would like to take advantage of this rate you will be expected to have your transactional accounts with SBS and place your income into this account. If you want to talk to us about your options, give us a call sooner rather than later. 0508 466 356. This is good news but with floating rates the risk is always there that they will rise. If you haven’t looked at the structure of your home loans in a while, feel free to contact us we are always happy to have a look at your setup and advise accordingly. Advanced Mortgage Solutions with the help of Sorted.org.nz will set out some tips to get you on track for buying your first home. There is no getting away from it, you will need to save a deposit to buy your first home. Depending on deposit total (by accessing your savings, KiwiSaver, and the First Home Buyers Subsidy), there are many different options available to first home buyers. Generally lenders do require 20% deposit, however there are exceptions to every rule such as the Welcome Home Loan. The Welcome Home Loan only requires 10% deposit and you can get help securing this deposit through KiwiSaver withdrawals or gifted by a relative. There are some rules applicants need to be aware of when trying to use the Welcome Home Loan product, so please don’t hesitate to pick the phone and have a chat with us about the process. There are also some positive changes to the Welcome Home Loan product that take effect after the 1st of April. We have a first home buyer’s guide that shows a step by step plan on buying your first home. This along with our experience will see you sail through the minefields of obstacles of buying your first home. Get into a habit of budgeting and not only will you get into your home much quicker, you’ll find repaying your home loan and covering all of your outgoings a lot less stressful. We also have a number of existing ways of structuring your home loan, enabling you to pay off your mortgage faster and save thousands of dollars in the process. With Wednesday’s announcement that Reserve Bank restrictions in regard to loans for those with less than a 20% deposit staying for now, with no changes to policy surrounding this, no doubt there are many thinking home ownership will always be out of reach. Don’t be totally despondent though as there are options and solutions that may work for you. Banks review their appetite for low deposit lending regularly, particularly around surplus income required to meet their criteria for borrowers in this space. Where you could be declined one month, the next could see an approval based on the banks percentage of loans written and whether that figure is over or under the allowed percentages stipulated by the Reserve Bank. The competition for borrowers with a 20% deposit is still fierce, and although this may seem unfair to those of you struggling to even get on the property ladder, it actually enhances your chance of financing a home with less than a 20% deposit, as every loan written in the “greater than 20 % deposit” space releases 10% of that loan amount to the pool for low “less than 20% deposit” lenders. Take it that Mr Smith with a 20% deposit is settling a $500,000.00 loan this week, that means the low deposit pool now has $50,000.00 available to lend to those who meet the criteria. Some weeks we have seen banks with no funds to lend in this space, so this means that even though there is demand, there is no supply and therefore a decline may not need to be seen so personally as a reflection of your characteristics. It may simply be that there are no funds available and trying again may be the thing to do. Although this news may not make life less complicated for low deposit borrowers, we need to re-iterate that a large percentage of the clients we are helping are still First Home Buyers, Banks are lending above 80%, and there are options and solutions around moving forward. In the hope of restoring confidence we have below listed some top tips for sourcing finance and preparing for borrowing in this space. As always it’s better to know how you can get there if it it’s not right now, and as always we are here to help. The property market has certainly picked up over spring, however there is a lot of comment around the LVR restrictions imposed by the Reserve Bank in October 2013, and its effectiveness in dampening the market. The LVR restrictions imposed were designed to slow the market and reduce the exposure of first home buyers if the market was to fall. In September 2013, 80% + LVR lending accounted for 25% of all lending, and this was expected to climb. The restrictions meant that 80% + LVR lending could not exceed 10% of a lender’s total loans. The result is that 80% + LVR lending is now running at 8.4% of total lending. As a result of the restrictions, those most affected were first home buyers who had trouble raising sufficient deposit to enter the market. This in turn opened the door to property investors as there was less competition for homes in the lower price ranges. Property investors were able to increase their portfolios at the expense of first home buyers. In the meantime property values have continued to rise bringing into question the Reserve Bank’s decision to impose LVR restrictions. However there has until now been a cooling of the market in relation to new listings that may be due to restrictions in the LVR. If the LVR restrictions were to continue, this would further exacerbate the plight of first home buyers who have been shut out of the market. Young couples without sufficient deposits would be facing a lifetime of renting, which was not the original intention. Alternatively both lenders and borrowers have become more creative in structuring loans around security offered by generous parents. There is speculation that the lending restrictions will be relaxed and this is the subject of a select committee hearing to be heard on 11 November. The general feeling in the market is that the LVR restrictions have not had the desired impact, and that market forces will create a more level playing field in future. Markets adapt and we are seeing development on the fringe of our larger cities, like the new builds in Pokeno south of the Bombay Hill. We may see a growing trend of the baby boomers cashing up and moving to the provinces. This could ultimately stabilize prices as more properties come to market for this reason. We are seeing the resurrection of some less desirable areas as people focus on value for money and quality of housing stock. Ex state housing areas offer solid homes in handy areas. In Pomare in the Hutt Valley complete blocks of state housing have been demolished to make way for new builds at competitive prices. Those returning from overseas or migrating to New Zealand will always create a demand for property in areas of high employment. It is, as always, a question of supply and demand. This over time will have a levelling effect, and is an effective way in self-regulating the market, rather than Reserve Bank intervention.